Usagi Yojimbo has been rereleased as a 30 year anniversary 600 page special comic book that is absolutely beautiful. Bringing together the main sequence of the series to make a great start point in a wonderful paperback or limited 900 page hardcover book. I started this comic about half way through the main story line so it was nice to be able to go back and see the start of the story line. Stan Sakai did a great job of art, writing, and the book feels like it has his heart and soul in it, it’s a beautiful story line, full of Samurais, turned into Ronin, then how to survive mid-evil japan along the way. This is one of the nicest comic books we’ve picked up in months, and well worth every single penny you will spend on it. This is a great start point for people who are looking to start the series, or for those who like me started half way through so we can get more of the backstory. Celebrating the thirtieth anniversary of Stan Sakais beloved rabbit Ronin, Dark Horse proudly presents Miyamoto Usagis epic trek along the warrior’s path in a new series of deluxe compilations, beginning with over 600 pages of Usagis essential adventures. 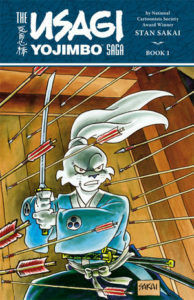 Collects Usagi Yojimbo Vol. 2#1#16 and Vol. 3#1#6! Overall rating this 5 of 5 stars, it’s beautiful, excellent lettering, great art, overall story line is brilliant, must purchase.